4. A study from Columbia University revealed that adolescents who had family meals at least 5 times per week were more likely to receive As and Bs than their colleagues who did not. 5. Jennifer at Food On Our Table, advocates for family meal time rituals because of the studies that point to kids who are less likely to do drugs or get depressed. Check out her terrific tips and courses on how to create family dinnertime! 6. Another piece of research ran regression analyses on the a myriad of factors from a population of Rhode Scholars. The single common variable identifying them as a Rhode Scholar? Their participation in family meals. Yes, great. I do that. Monday is soup! That’s tomorrow and I need to figure it out. I just posted on the Laundry Line about my Top Ten other things….what synchronicity! We do manage to eat dinner at home together most nights, though, since school is in full swing, the meals can be short depending on homework. We always light a candle for our meals, in the winter months, even for breakfast. A simple lit candle offers a sense of a warm center to the table and a certain special quality of reverence. The candle does not diminish arguments however. But, that is all part of the culture of the family table, right? Oh, you know, we used to have a candle and don’t any longer. I need to bring that back. Then I could just wander in and light it the next morning for coffee and meditation. Agreed. I was shocked when one of the routine pediatrician questions at the last appt was ‘how many meals per week do you eat with your family?’ and the top end number was 5-7. We live in a small school district where the kids walk home for lunch most days. My kids are eating a meal w/ at least 1 parent 19-21 times a week and with both parents 10 times a week. Even during the busy hockey/basketball/marching band/sewing class season, one of us manages to eat with a kid every night. We move often, and family meals are important to keep us all together. It takes planning, but is worth it. Wow, great job Kirsten. I’m a working mom so I really rely on the dinner time. You’ve clearly got this topic mastered and your children will benefit from you. Eating outdoors often makes the food taste better. That’s an important covenant to a great marriage Tandy. Good for you! Once children are gone, it can be easy to see things you wish you’d done differently, without another chance to make it right. Family dinner together was the way I grew up and – no matter how crazy life became – something I maintained when raising my daughters. That, and maintaining a daily reading time, are two things I did that I look back on with pride. Great post, Tammy! Thanks Cindy and great job. You’re an inspiration to those of us doing it now. Gosh, I am a strong advocate for family mealtimes, Tammy, but I never knew the Rhodes scholar thing! What a recommendation! I love mealtimes. They allow us to stop that Kolb cycle and reflect, and then bring our learning back to the life we lead. It is very cool. Ahhhhh. It’s nice isn’t it? Tonight we had so much homework in our home that I let everyone bring it to the table and did a leftover mich-match. It probably didn’t contribute much to my future Rhodes scholars but it might help out on Mr. Crabb’s friday science quiz. Great advice! My family ate together when I was a kid; less so when I was a teen. One thing that helped me a lot in life was one of the chores I had to do in order to earn my allowance: I had to prepare the family dinner one night every week. It was like my version of home ec I suppose, but I learned to cook in the process. To me the kitchen became another science lab, a place of fun where things were mixed together and results checked. No doubt the family ate some weird stuff over the years, but I entered adulthood as a young man who not only wasn’t afraid of the kitchen, I actually enjoyed it. I love the idea of giving a kid a night a week. That’s a great idea. I think I’m going to try something like that and then have them explain it to us over the meal. Thanks Rob. Love this post. The research citations are wonderful! I will add one rule to your reasons: no electronics. It’s important to BE THERE, not just be there. Agreed! I am so guilty when we go out to eat. I find myself checking my phone far too often and then when I look around the table, everyone is doing it. For some reason, I don’t have the same issue at home. Love the research that illustrates the importance of family dinners. This is a big idea! Your family deserves nothing less. I agree though somewhat sadly, as our ‘family dinner’ five nights a week is just my son and I, as my husband works late each night. Most times we eat with the tv on and I know I can do better but I’m mostly exhausted/out of ideas by dinner time… I’ll have to work on making it more meaningful. We recently started to have dinner together almost every night (even though Nora’s bedtime means dinner at 6 pm) for lots of these reasons, but mainly #1. It’s important to me that she eats what we eat and gets time to interact with us at dinnertime. Great list! I would love to eat at 6 but that’s just not possible. It is important for her to eat what you eat! I should’ve referenced that. Great add! Thanks Kath and I enjoyed your recent posts on the meals with your parents. When my family comes together, the meal planning, preparing and eating is a big part of how we relate. it’s good to see these studies bolstering what we already sensed about the importance of dining together. all the connections we make over the table, through words and actions, are essential to our core human experience. As a single working mom, it was at times difficult, but we did our best—my daughter and I—to sit down and dine together every night we were together. It did help that I ran a catering company–sometimes I would bring homr something good from work, when I was too beat to cook. The picnic idea–which I sometimes would spread over a blanket on the living room rug in wintertime—was a fun way to dine. Oooh, I bet it helped that you had a catering business. I always have one night each week that is either leftovers or takeout. It lessens the load. We spent a year living with my mother while our house was being finished. She owned and operated the local cafe and so most of our meals were spent eating and working there. Having a sit down family meal was the thing our children really missed and basically demanded that we have. 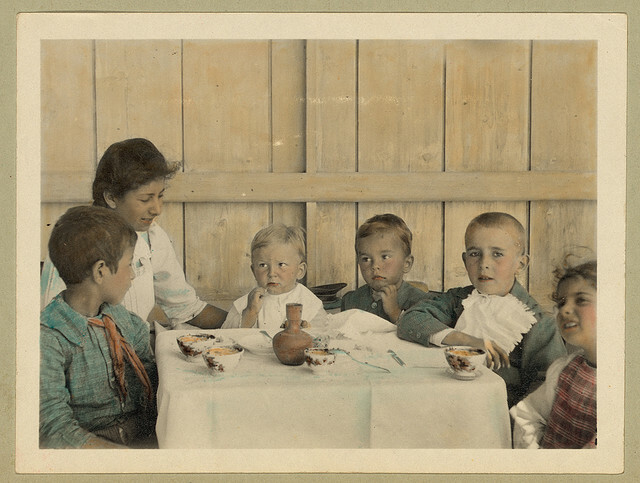 We did go back to family meals as often as possible when our own house was finished. I think that of all the things we taught them, they will take the family meal thing to their familiy lives. Thanks so much for sharing this. That’s terrific! I love that they missed it. I hope my kids will say the same one day. Boy, I’m feeling like a pretty cruddy mom in this crowd! My husband usually cooks dinner, and he lets the kids help. However… then we usually eat in front of the TV. Bad mom. I know it’s better for many reasons to eat at the table. I feel guilty saying it, but it’s also one of the few times a day when I can relax and NOT have to talk! As soon as dinner’s over the TV goes off and I’m interacting with the kids for hours until bedtime. Making lunches for the next day, talking about their days, helping with any last homework questions, and the list goes on. Am I truly damaging them by taking that 1/2 hour to chill out in front of the TV? I can’t be the only one here! That doesn’t sound cruddy at all. You’re just mixing up the order a bit more. Your husband and kids putting a meal together is fantastic. Thanks Tammy. Sometimes a little validation is comforting! Sounds like your kids have seen the benefits! This is great, Tammy, thanks for the rundown 🙂 I know I like them now, and I’ll have family dinners when I have kids, and all too. Just taking a look at the (nearly 6 yo) little girl I babysit, she has no real table manners to transfer to any other social setting. For instance, she won’t use a napkin, ever. Sticky hands don’t matter. (She won’t even blow her own nose, but that’s another story.) She eats in bed, in front of the TV, for hours, because she’ll get immersed in what she’s watching. When having her snack after kindergarten, she’ll simply hand it to me when it’s half eaten, or bring me the baggy it was in, even if my hands are full and expects me to throw it away. Then there are families who always have family dinners, and you can tell. Friends with a 3 yo little girl visited us last night, and the kid was a delight to watch. She ate a slice of apple pie – used a napkin, didn’t touch everything around her with dirty hands, asked for a tissue to blow her own nose when she sneezed. Manners are really important and just as you’ve discovered, they set kids apart. I had heard some of this research before, but the Rhodes scholars? That is astounding. Isn’t it? I actually heard that fact during a sermon and it piqued my curiosity to learn more. Alas we are doing “family dinner” in the 15 minutes between swimming and ballet right now. But swim season ends in a week, and I love your idea of reinforcing table manners at dinner! Give one of your kids the challenge of making it meaningful. I’m sure they won’t disappoint. Eating together is really enjoyable and it’s about the only time I can get the kid’s full attention. We eat as soon as the kids come home from school so they have energy for their activities, plus, they are starving when they walk through the door. Thank goodness for crockpots and ovens! Dinner is a great time to take a break from the day, shift to evening routines, and really enjoy a few minutes together. We eat at the other extreme – quite late. I’d love to eat earlier but it’s a challenge. Yes, it is a challenge. For a long time, we would have a large snack after school and then eat later in the evening. But I found the kids were eating snacks and not as much dinner. I miss having DH eat with us, but we do what we can and it makes weekends that much more special. I think it’s great that you make a point to eat together during the week–it’s not easy! Without distractions like television, we are more aware of what we eat, how fast and how much we are eating. Oh, that’s a great point Toke that I failed to state. This is amazing! There are so ideals I support that go along with this, I feel like it ties everything together. This makes so much sense. I learned to appreciate this more with when I had to take children out in public. A minimum of table manners and polite dinner conversation go a long way. Food is so important. Great point! We never avoid that because our kids know how! Well, I know this will make me sound tough and overpowering but I correct the children of others in my own home. I expect a please and a thank you and basic manners here and like you, I am often very surprised at the lack of them. Whew, ok, and I thought I was the only stern, mean mom out there. Good to know I’m not alone. I don’t limit my corrections to in the home, I’ve been known to correct at the mall, hotels, and family wedding as well. There you have it! And you remember it as a fond memory which says a lot Sophie! I grew up in a big family and eating together was a big think for us. It made us feel close to each other which now I truly apreciate. I’m hoping to do the same with my family. Thanks for the reminder. Priceless! Thanks for visiting! I love large family meals. Great post! I’m thrilled to see that our grown extended family continued traditional Sunday dinners together in our absence. Family lunches (more so here) or diners are so important ! We used to be four for dinner every day, lively moments. Now Sundays are the days where the extended family gather for lunch. Always a special meal, traditional or a new recipe. We all enjoy it very much.